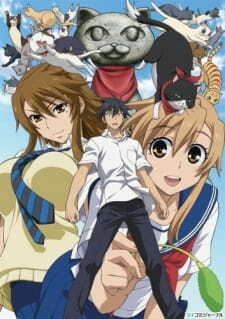 You got to be an cat-addict to enjoy this anime fully. If not, you may find it a bit boring and rather random; after all, it is a story about a guy that cursed by a cat statue and have to perform good deeds to redeem himself. Junpei Kousaka is a second-year high school student who despises cats and has an allergy to them. It just so happens that his high school crush is Kaede Mizuno, a girl who adores cats. One day, while walking home from school, Junpei kicks an empty can and unfortunately beans the local neko-jizou-sama (guardian deity of cats). He finds he can now understand what cats are saying, including his family's own ill-tempered cat, Nyamusas. However, if he does not grant 100 wishes from cats, he will turn into a cat himself. It is one of those anime that has an interesting story development but doesn't take it any further than it should. Nyan Koi! is basically about a guy that gets cursed by a cat statue because he broke it. The curse enables him to listen in on cat's conversations including his own family cat. However, if he does not listen to the cat's wishes and grant 100 of them, he will turn into a cat himself. Sounds silly right? In a way it does sound a bit silly for a storyline; but the entertainment comes from the adventures and misfortunes he encounters whilst granting those wishes. I felt that there were many potential paths that the story to take that would make it even more interesting but in the end, the story just had to take the boring route. If you are not a huge cat fan, then the story would be totally meaningless to you. The art was pretty good overall with some detail in environments that really stood out. The characters were decent, but overall really generic. I did not find them that memorable from their appearance. The main protagonist as always felt too similar to other anime such as Index/Railgun and other series with a male protagonist. Cat design was quite good though. The sound quality was pretty good and most characters suited their voices really well. I did not have any issues with the sound in this anime except I would think how cats would sound if they could actually speak. The theme songs were pretty generic and rather unmemorable. Character-wise, the anime's portrayal of characters were pretty generic. I wouldn't say that they were that bad; but I felt they could have been improved a lot. It felt like the relationships between the characters were not that deep and quite boring to be honest. Junpei Kousaka lacked any exciting qualities that I liked and most of the girls in the anime were either too boring or wasn't developed enough to be memorable. In the end, I would say it was another watch-and-forget anime. I already have forgotten mostly what happened in the anime but I can say that even if you do forget, there really isn't much to forget at all. The story as a hit and miss and the characters were slightly dull. In the end, it all comes down to whether you like cats or not. There seems to be plans for a sequel but there is no news of when that is going to happen.